Wow, I just love the pictures that are posted here. I bet it is so relaxing. Thanks for sharing. I think we got about 6 inches of rain on that last gulley washer!! I love this time of year. Watching the prarie come back to life. All the rain helps, and I'm going to heed your suggestion on a spray skirt for the yak. I hope you can make to the Lower Mountain Fork. Thanks for taking the time to comment, April! 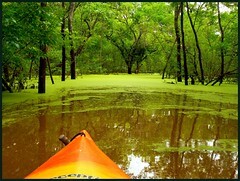 Yakker, I will be paddling the LMF sometime this year, but I don't know when. I will be quite sad if I have to miss the big Oklahoma Flatwater Paddlers get together in April, but so far, it looks like I will be missing it. 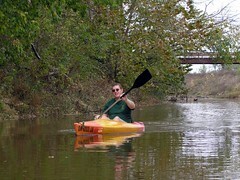 Sometime in early summer we plan to take Dylan down the Elk River in Noel, MO. I will ping you when we set the date, probably in late May.